With spray driers now being specifically built to manufacturer higher yield products such as nutritional and specialty powders, many process and quality professionals are looking at “how can we assemble, operate and increase cleanability of nozzles, meet our stringent audit, HACCP and HAZOP risk identifiers, but still operate a complex atomising nozzle, that has threads, high-pressure o-rings etc. Without using additional chemicals that are in direct contact with the product, that I have been told are required in nozzle assembly”? The standard convention was to use a basic radial o-ring seal body design, without a backup ring to avoid extrusion, which as we know from most international sealing standards, was suitable for lower pressure applications, but may not be recommended for certain higher pressure operations. To try and ensure that this radial o-ring made contact with the inner wall of the cap assembly for lower pressure sealing (as long as the inside diameter of the cap wall had not been worn from constant assembly / dis-assembly), many manufacturers tightened the internal assembly dimensional tolerances of both the plug i.e. the cap and the socket i.e. the female weld body, thus trying to ensure a better seal. This fact, coupled with the use by some manufacturers of finer thread forms of similar stainless steel types for both the cap and weld body; along with exposed radial body seals inserted into even tighter body socket diameters; has seen the necessity of some dryer operators resorting to the use of chemicals and lubricants to aid in easier assembly and thus avoiding assembly damage. Tight assembly tolerances in plug and socket radial seal nozzle designs, especially in what is now known as the problem of “dry assembly” o-ring damage, can manifest itself in one or all of the following two ways, (unless such measures as chemicals being added to the process), something that dairy companies may wish to avoid. When tight design tolerances meet fine thread forms and similar stainless grades used for both bodies and caps, on mechanical assemblies that in normal circumstances would not be assembled or disassembled or handled when both hot and requiring cleaning after each run, where the propensity for impact damage is increased, then inevitable increase in cross threading, binding or thread galling-damage ensues. To date one of the few ways to try and reduce the incidence of thread biding or galling was the application and use of anti seize or anti thread galling chemical paste. Originally designed for heavy duty industrial applications, many of these chemical compounds are not recommended or suited to direct food application contact. Furthermore, for many validation or audited production systems, the elimination of any or all foreign chemicals in direct contact with finished product, i.e. infant formula or inhaled powders is a pre-requisite, unless a stringent testing and approval regime has been undertaken, or that the product has been approved as “fit for human consumption”. Until the release of the Click&Dry compact series nozzles by Spray Nozzle Engineering, that does not require chemical assembly lubricants and anti-seize compounds, there no true “chemical lube free” spray dry nozzles on the market. Spray dry nozzles with plug and socket assembly designs, as mentioned have for many years now, employed extremely tight assembly tolerances to try and assist in the radial sealing function. However, when this methodology of design is used in real life situations, i.e. on a part that must be assembled by hand, daily, the design drawbacks and in many cases dangers are quickly exposed. The radial seal on the nozzle body protrudes beyond the sealing groove or gland, as the o-ring is screwed into the mating female cap or socket arrangement, this very first contact made with the corresponding inner diameter of the socket or cap continues all the way in, until the thread has run out and the assembly finishes in its final position. The very act of continually screwing the cap over this exposed tight radial o-ring, can begin to stretch and pinch, then catch, drag, and then very quickly tear the o-ring. In this very instant, any sealing properties it may had had are instantly compromised. The added danger to this, is that an operator now cannot see the compromised sealing gland. The only remedy to this was the use of chemical compounds added to the assembly process to try and help the o-ring pass into the body without tearing. O-ring stretching and pinching as well as tearing has now been recognised by both end-user dairy company safety groups and dryer OEM’s themselves, with many even writing this into their safety manuals to try and reduce the threat as much as they practically can, or to eliminate it all together by switching to a complete compressive axial body seal arrange, as used by Spray Nozzle Engineering successfully on their Click&Dry system now for over a decade. The only solution to date for these older radial seal nozzle designs is to introduce yet again, another foreign chemical compound into the assembly process. Known as o-ring lube or just lube, these chemical compounds only purpose is to try and reduce the friction between the radial o-ring and the tight tolerances of the cap or plug design, in the hope that it will slip into the tight squeeze and hopefully slip without either being pinched, torn or even in some extreme cases dislodged due to incorrect o-ring sizing or placement by operators. In some extreme cases, the excessive use of o-ring lube can have the opposite effect, in that too much is used and the hydraulic effect of too much lubricant can prevent correct o-ring placement in either the gland or assembly. 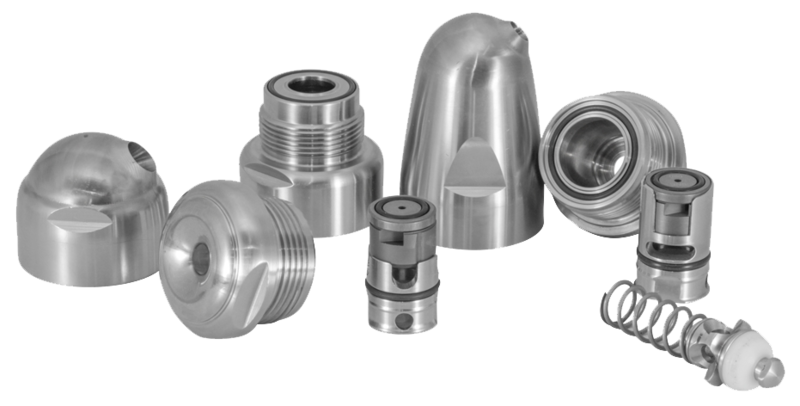 By using Spray Nozzle Engineering’s compressive axial seal system, nozzles can be assembled without the need to introduce or use yet another foreign substance or chemical to the assembly process. As a side note to our discussion on radial o-rings. under normal static assemblies, radial o-ring seal assemblies are static and may not be disassembled for some time and as mentioned, depending upon the operating pressure, they may incorporate in their design, the use of a backup ring, which is designed to reduce o-ring extrusion. The extra expense of a backup ring, the care required to insert it on the correct side of the o-ring and the time taken by operators to fit, has made them mostly impractical to use daily in spray dry plants. So it wasn’t until the introduction of compressive seal or axial seal technology as found in the Click&Dry nozzles by Spray Nozzle Engineering, that for the first time high pressure spray dry nozzle could be assembled without the worry of radial extrusion, o-ring pinch or tear. Can we make our nozzles “assembly chemical additive free”? Many spray dry nozzle applications, the amount of chemicals used in the assembly of these nozzles, can be reduced simply by looking at better spray dry nozzle designs, such as the Click&Dry nozzle series, that has actually been in operation world wide now for over a decade. the reduction in added chemicals also reduces the risk of over use and contamination, allows easier cleaning and hygiene of the entire system, but also assists in the auditing and safety function of plant operators, as the is simply two more chemicals taken out of the manufacturing process. Added to this, is the benefits of using an up to date nozzle system that is fit for purpose, more hygienic in its design, easier to assembly without operator error and delivers better performance and cost reduction to both operators and dryer OEM’s alike.